If you are going to own something from a prestigious brand then you want people to know that it is the real deal, and spelling the name of the maker accurately usually plays quite an important part in this. 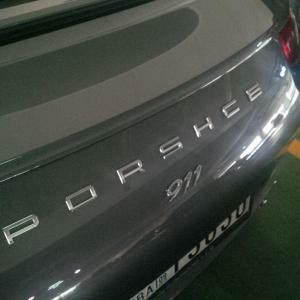 So it is not surprising that a customer was stunned after he took his £100,000 Porsche 911 into a car repair centre in Dubai to have a dent in the bumper removed, only for it to come out with the maker's lettering reading 'Porshce'. A friend of the car owner tweeted a picture of the blunder to ex-Top Gear host Jeremy Clarkson, who in turn retweeted it, and within hours the story went viral. Car mechanics face many risks in their day-to-day jobs; for most of them a road risks insurance or combined motor trade insurance policy will help ensure any blushes are spared and any damage is limited. However, sometimes a spell checker will come in handy too. It was Ollie Martin, or @OllieDjMartin, who took to Twitter to share the funny mishap. He tweeted: "@JeremyClarkson A friend in Dubai took his 911 in for a prang repair, this is what Porsche did… BRILLIANT!" Unfortunately, no more information about how the story ended was made available, but it is safe to assume that the red-faced mechanics who were working on the German sports car quickly set about rectifying the problem once they and the disgruntled customer had realised what had happened.